user warning: Expression #1 of ORDER BY clause is not in SELECT list, references column 'hotkilns_live.n.created' which is not in SELECT list; this is incompatible with DISTINCT query: SELECT DISTINCT n.nid, n.vid, n.title FROM content_field_videos_features nr INNER JOIN node n ON n.vid = nr.vid AND n.status = 1 INNER JOIN node_access na ON na.nid = n.nid WHERE (na.grant_view >= 1 AND ((na.gid = 0 AND na.realm = 'all') OR (na.gid = 0 AND na.realm = 'content_access_author') OR (na.gid = 1 AND na.realm = 'content_access_rid'))) AND ( nr.field_videos_features_nid = 239 )ORDER BY n.created DESC in /home/hotkilns/public_html/sites/all/modules/nodereferrer/nodereferrer.module on line 428. Our testing program proved that thermocouples will last longer when protected by a mullite tube. Read about L&L's testing program to determine the best thermocouple system. 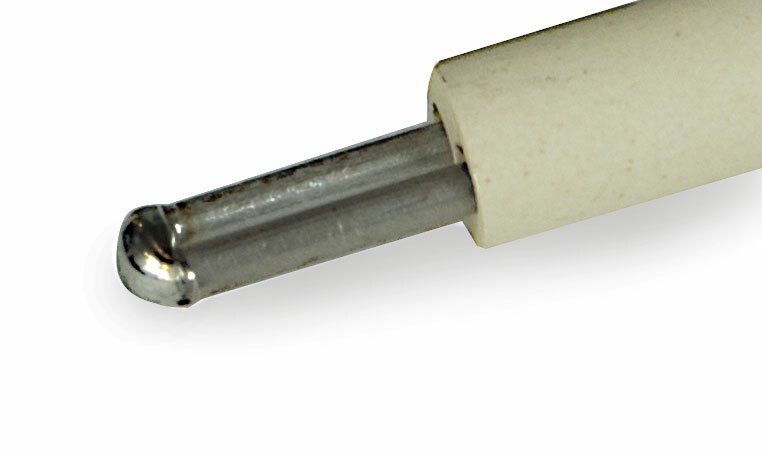 The mullite protection tube keeps the metal oxides of the thermocouple tip from dropping off and contaminating your work. This is particularly important for porcelain work. One major advantage of these protection tubes is that you can replace your old thermocouples with inexpensive standard 8 gauge thermocouples without changing the protection tube. Protection tubes rarely need replacing. The tubes protect the end of the thermocouple form damage while loading. A thermocouple in a protection tube does have a delayed response and hence an offset needs to be programmed into the control. (Exposed Type K, small-diameter Type S thermocouples, or metallic sheathed thermocouples are more sensitive and need no such offset). However, our test indicated that every thermocouple measured slightly different temperatures anyway. The DynaTrol control has thermocouple offset and cone offset to allow you to compensate for any such effects. The One-Touch™ control has thermocouple offset. For ceramic work we recommend calibrating the kiln performance with cones and adjusting the control to match the performance of the firing cones. The most important thing is to get a consistent reading from the thermocouples. The protection tubes are 3/4” in outside diameter with a 1/2” inside diameter (which accommodates the standard 8 gauge Type K thermocouple). There is a flange on the back end of the thermocouple to prevent it from going into the kiln.